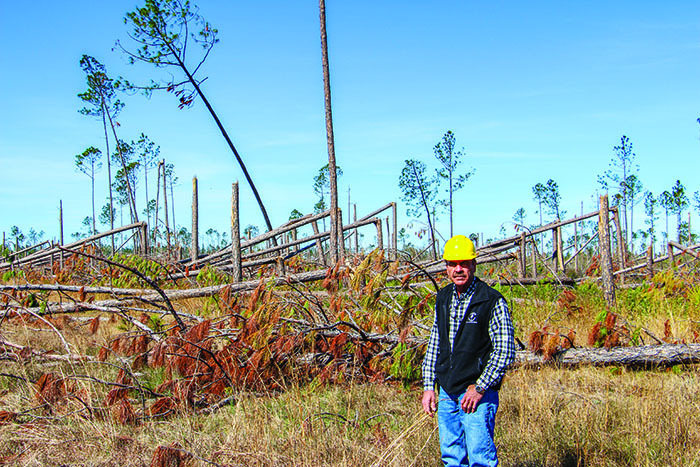 The Florida timber industry is truly seeing the consequences of Hurricane Michael nearly seven months after the storm hit. Rot, bark slippage and blue stain are beginning to settle in as timber salvage efforts continue in the wake of Hurricane Michael. Michael came ashore October 10, 2018, the eye crossing Mexico Beach and then moving inland and northeast, causing catastrophic or severe damage to 2.8 million acres of Florida timberland according to the Florida Forest Service. A Category 4 hurricane with winds reaching 155 MPH, Michael cut an 80-mile wide swath across 11 counties in the Florida Panhandle, where conservative estimates put timber loss in the state at $1.3 billion and total damage expenditures at $39 billion. According to the Florida Forest Service, 72 million tons of prime timber were broken or blown over—imagine 2.5 million loaded log trucks—affecting 16,000 private landowners. Florida’s estimated monetary timber loss is just less than double that reported by the Georgia Forestry Commission, which stated that 2.37 million acres of Georgia forestland sustained damage valued at $763 million. In packaging an emergency landowner assistance funding request of $583 million, the Florida Forest Service indicates the potential for significant increase in wildfires over the next 10 years. Usually, the Panhandle has 4.87 tons per acre of available fuel; post-Michael, the average is 58 tons per acre, a 10-fold increase, and in the catastrophic areas of Bay, Calhoun and Gulf counties there is more than 100 tons per acre of fuel on the ground. Wildfires aren’t the only major concern for the Panhandle. Reforestation remains uncertain for the 16,000 private landowners who make up nearly 80% of the devastated timber base, as they watch family investments, college funds, retirement funds and other generational security rot away. Florida Forest Service notes that without guidance and financial support many of the private landowners will not clean up and will definitely not replant. Florida Forest Service Director Jim Karels told a Senate committee it could take a decade or more for Florida’s timber industry to recover as he recommended that the state provide funding to help nonindustrial private forest landowners clear fallen trees and start replanting the forests, and for equipment and programs to help reduce the fire threat. Coastal Plywood in Havana, Fla. lost about a week of production following the storm due to power outage, but the mill held up well during the storm. Officials expect to see some increase in raw material costs, and without question an increase in haul distance. Rex Lumber’s SYP sawmills in Graceville and Bristol, Fla. had to cut production in January due to weather and log flow. Winter rain hampered the recovery effort, and an official there said the window to salvage wood had moved into weeks. Sapp’s Land & Excavating, Inc., based in Chipley, Fla.—about 70 miles north and slightly west from where Michael’s eye came ashore—reduced number of operating crews from five to four due to losing a few employees to the demand for equipment operators in the area for the cleanup effort. Sapp purchased and implemented a John Deere 2554 log loader with a dangle sawhead that allows the operator to cut wood parallel to the ground. For Sapp, whose main chips market is Enviva’s large wood pellet mill in Cottondale, production has shifted to a higher concentration of standing timber, as opposed to timber already blown down from the storm. Morris Timber Products of Lynn Haven, Fla. made machine purchases following the storm to aid operators and bring efficiency to its peak. Morris has two Barko 595 track shovel machines outfitted with topping saws in order to clear up standing trees that are broken. Morris has his shovel operator trying to handle cutting and pushing stumps as best as he can—with the realization that stumps are going to be one of the biggest challenges to those who decide to replant. His crew is also making heavy use of two Caterpillar 521 track cutters with 360 degree rotating sawheads, which allow operators to flip the head over and cut trees on the ground. WestRock, which operates a corrugated packaging mill in Panama City, returned to full production of containerboard during November 2018; however, given the damage to the facility, the company didn’t expect the mill to return to full pulp production until the end of June. In early April, the Florida legislature was nearing passage of a $90 billion budget that included $1.6 billion in emergency funds and another $220 million for Hurricane Michael. Forest2Market, a global provider of timber prices, market data and in-depth analytics for suppliers and consumers of wood raw materials, believes overall the damaged timber inventory represents about a 12-year equivalent of current annual removals and more than a 15-year equivalent in the severe and catastrophic damaged areas. The impact of the initial loss of inventory combined with the intense harvesting in areas only moderately damaged, or those left luckily unscathed, will result in an age/class imbalance. Forest2Market believes this will help intensify competition for available timber and result in some strain on supply that will drive prices higher for years. It is possible this will also affect the current oversupply of sawlogs. Federal government aid could also come in the form of timber sales and harvesting in the Apalachicola National Forest, which is east of where the storm came in. Some tonnage could be flowing out by the end of this year.